This interactive presentation contains the latest oil & gas production data from 20,246 horizontal wells in the Eagle Ford region (TRRC districts 1-4), that started producing since 2010, through December 2017. With more wells completed than in the previous year (~1640 vs ~1500), oil production showed a modest year-on-year gain in December. Also for this basin I made some improvements in the data processing, and now a more complete picture is given for the last couple of months (although I still expect upward revisions, esp. for December). Gas production is also up, to almost 6 Bcf/d (change ‘Product’ to ‘gas’ to see this). In the last tab (‘Top operators’), the production from the leading operators is shown. The top 2, EOG & Chesapeake, are almost back to their previous production highs. 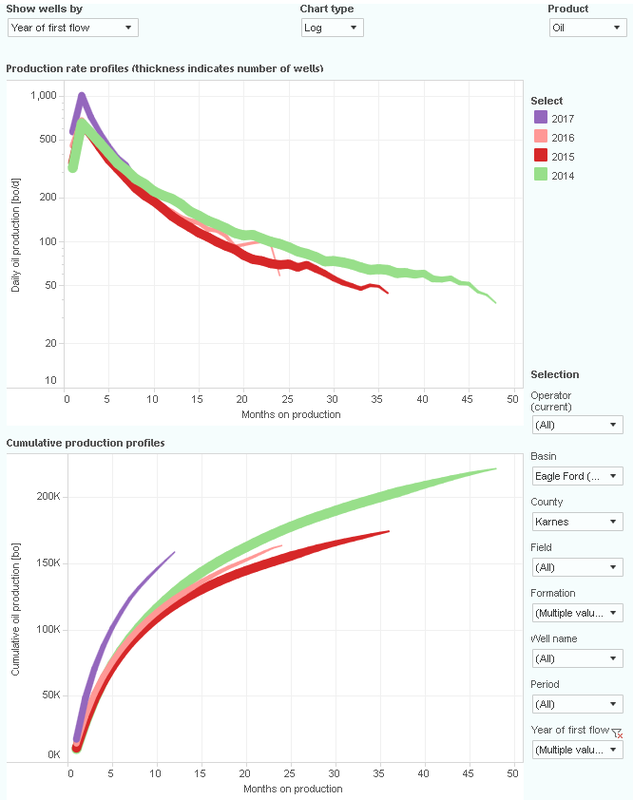 In this “Ultimate Recovery” overview the relationship between production rates, and cumulative production is revealed. Wells are grouped by the year in which production started. This overview shows the averages over the whole basin; how much oil or gas is produced can vary wildly by area. For example, if you select only ‘Karnes’ (using the ‘county’ selection), you’ll see that average oil production is significantly higher. Note however that this will also give some indication that long-term well productivity is falling, as the 2015-16 vintages are tracking a lower recovery than the 2012-14 ones! 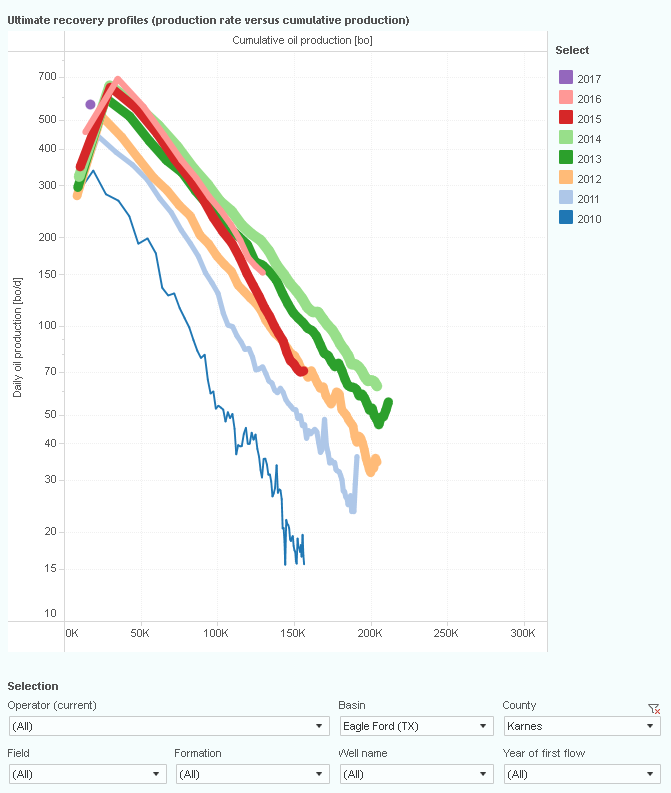 Next week I will have a post on all 10 covered states in the US, and another one on a projection of the oil & gas output from all these horizontal wells several years into the future. Hi Enno, in your tweet you mentioned that there are signs that long-term well productivity is falling. Just curious where you see that? I’m looking at the “Productivity over time” tab, and it looks like the most recent 24 month number is 124k, which is a very modest decline from 125k from the previous quarter. But both of these productivity numbers are above the previous measures of productivity. So it seems like stable productivity and even an improvement from previous quarters. Are you normalizing for lateral length, or proppant, or general capex per well when you mention productivity is falling? I was talking about the long-term performance, and by this I meant >=4 years, of wells in Karnes, which is the heart of the Eagle Ford for oil production (see the ‘Cumulative production ranking’). While I also like to use the ‘Productivity over time’ dashboard, it only shows historical data, and in this case I was trying to peer a little further in the future. The easy way to see what I meant is to just select ‘Karnes’ in the ‘Ultimate recovery’ overview. See also the screenshot below (which is what I showed on Twitter as well). Wells that started in 2017 in Karnes had in general a very good start, but I would argue we need about 1-2 years more data to see how they stack up to the 2013-14 wells. In this case there is an advantage of using the ‘Well quality’ tab, as there the incomplete tails of a certain vintage is also shown, unlike in the ‘Ultimate recovery’ view. E.g., here in the screenshot below we can already see the preliminary behavior of the 2017 wells in Karnes. In these comments I did not consider yet any changes in well design. Lateral lengths in the Eagle Ford increased by about 20% in the time span from 2013-2017 (for Karnes ~5% though), according to my data, while proppant volumes even more than doubled (also in Karnes). I have not yet gathered data on well CAPEX, which indeed would be another very useful metric to normalize on. Interesting Enno, based on this analysis, is it fair to say that Eagle Ford, as a whole, most likely peaked in 2015 at little over 1.6 mb/d? Thanks Alex. I think this is an interesting data point, but not enough to make such a statement. I have no idea whether the Eagle Ford will experience another peak. Thanks very much for your comprehensive reply. One followup question I have: is there a reason you focus your analysis on Karnes? I understand that Karnes is the most significant county for Eagle Ford production, but it looks like it only represents 20-25% of total Eagle Ford production. Wouldn’t it make more sense to conduct your Karnes-based analysis for the whole Eagle Ford? If we conduct your analysis of the “Well Quality” tab for the whole Eagle Ford, the conclusions are a lot less clear. The 2016 cohort on cumulative production is well above 2014 and 2015, and both 2014/2015 are well above 2013. So from this analysis, it’s not clear that we are seeing any deterioration in productivity/efficiencies. If anything, it suggests the opposite conclusion. Perhaps your Karnes-based analysis is most valuable for normalizing for lateral lengths? As you pointed out, lateral lengths are only +5% in Karnes versus +20% in the Eagle Ford. So maybe conducting the well quality analysis is valuable on counties in which there hasn’t been a substantial increase in lateral length? The purpose of this site is to get insights in the latest developments of the shale oil & gas industry, and to allow anybody to share their own analyses, knowledge and views. Every month I post the latest data, and try to identify and share some interesting developments or findings. My focus on Karnes was indeed because it is the heart of the oil production in the Eagle Ford, but my comment wasn’t meant to say more than it did. So doing similar analyses for parts or the whole of the Eagle Ford can be very useful indeed, and I thank you for sharing your results on that. I am currently working on providing more analytical dashboards, which will also allow one to see the relationship between well results and changing completion practices. Makes sense Enno. Thanks as always for the response and for the excellent website and data.